John Lennon and Paul McCartney might not agree, but I thought this home’s rendition of “Help” was worthy of a renovation. “When I was younger, so much younger than today, I never needed anybody’s help in any way. But now those days are gone, I’m not so self-assured. Now, I find it’s time to change my windows and need to open up the doors. It wasn’t the age of this home that had it feeling down, it was a case of the wrong style covering up the authentic beauty of the arts-and-crafts exterior. 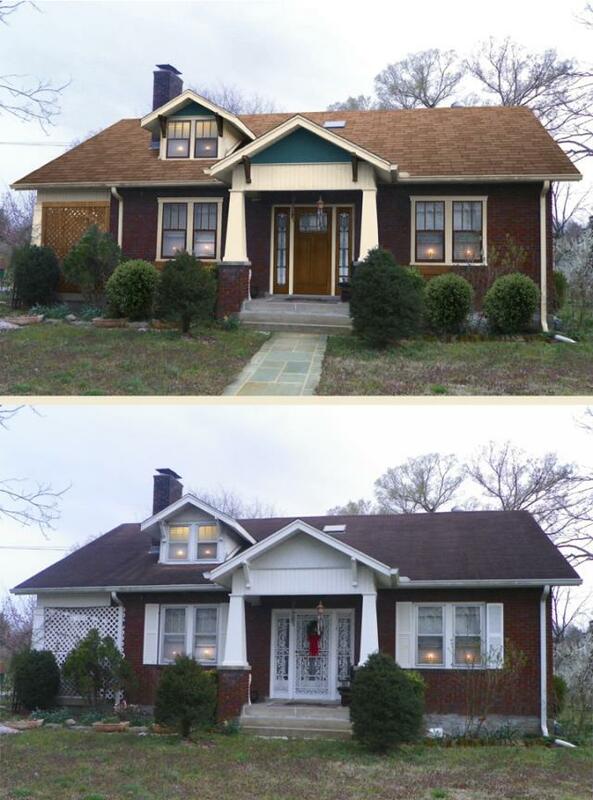 Time to strip this home of those mismatched pieces and give it a look that was true to the home’s style. I wanted to give this home a reason to change its tune. I started by removing the “over-wrought” white front door. In its place I chose a Therma-Tru Classic-Craft American Style Collection fiberglass entry door stained in cedar with a doorlite and sidelites in the Villager decorative glass style. Then off came the shutters and it was as if the home breathed a sigh of relief because it would no longer have to try to be something it wasn’t. I smiled as I saw the life coming back into this home. Decorum by Simonton vinyl replacement windows with Chocolate exterior frames along with new urethane timber square pot shelves beneath each window from Fypon had the look of what would have been used originally on this home. Urethane Timber Stained Brackets above the door and near the dormer window added another arts-and-crafts accent to the home. The columns on the front and side porch were a detail I wanted to highlight so I gave them a new look with Fypon’s popular Column Wraps. I also replaced the privacy lattice on the side porch with a stained grid work that complimented the other elements of this home. The DaVinci Multi-Width Shake roof in New Cedar that includes a combination of five shades of cedar colors was the perfect choice to connect the colors in the door, windows, brick and trim. The “top down” color added to the home by the roof made it the ideal selection for this structure. Come back tomorrow to get the inside story on another of the makeovers of the “Shake it Up” Exterior Color Contest Finalist. And if you missed the Monday or Tuesday inside story, click here for Monday and here for Tuesday.